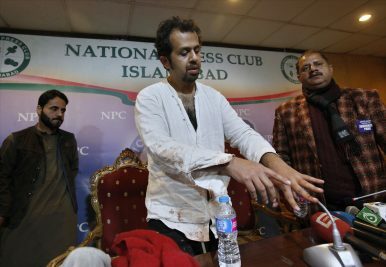 In this Jan. 10, 2018 photo, Pakistani journalist Taha Siddiqui, center, who is in exile after an attempted kidnapping, speaks to reporters in Islamabad, Pakistan. The well-known journalist is living in exile after narrowly escaping an abduction attempt by gunmen. On July 25, 105 million registered voters in Pakistan will head to the polls to determine a new prime minister. But media and publications in Pakistan are increasingly censoring themselves under the pressure of the military establishment. Pakistan ranks 139th out of 180 countries in Reporters Without Borders’ 2017 World Press Freedom Index, and threats against journalists are on the rise. Journalists from Pakistan say that media outlets are now chained as never before. Many journalists have left the country after experiencing threats and intimidation on regular basis. The country’s most popular television channel, Geo TV, was forced off the air, and distribution of Pakistan’s oldest newspaper, Dawn, has been distrupted. During the anti-government, anti-military protests by the ethnic Pashtun minority, members of which have accused the army of enforced disappearances, extrajudicial executions, and other human rights violations, state censorship took a dangerous turn. Journalists received threats or intimidation regarding the protest coverage and saw their reports and articles blocked. One victim of the crackdown is well-known Pakistani journalist Taha Siddiqui. He left Pakistan in January this year, shortly after gunmen hit, threatened, and tried to kidnap him in broad daylight in Islamabad. Siddiqui, 34, formerly an Islamabad-based journalist, moved to Paris after the failed kidnapping attempt. He is an award-winning investigative journalist whose work has been published in The New York Times (NYT), The Guardian, France24, and other international media. He has also served as the Pakistan Bureau Chief of the World Is One News (WION), an Indian news channel. In an interview, he talks about media censorship, the military’s intervention in Pakistan’s foreign policy, the mainstreaming of militants in the upcoming election and his new initiative — safenewsrooms.org — that he recently launched to document stories of censorship from newsrooms in South Asia. This interview has been lightly edited for length and clarity. Aaquib Khan: Why do you think you were targeted for abduction? Taha Siddiqui: I have been receiving threats from the last almost five years. It started with a NYT article that I wrote [in 2015] about secret military prisons and how suspected militants are extrajudicially killed in those prisons. Before that I was usually writing on civil military affairs and particularly about the military issues in the tribal belt, the military’s interference in politics, military’s foot prints in the business industry, the way the military operates when it comes to militancy in Pakistan, with regards to the “Good Taliban, Bad Taliban” policy, in which there is a selective crackdown. So I was talking about all those issues. The threats started coming from the military — indirectly in the form of messages to my friends, and directly in messages to me to say that I should stop criticizing the military. A number of times I was told if I didn’t stop, things would go wrong for me and eventually that is what happened. On January 10th this year what is suspected to be Pakistan military personnel tried to kidnap me when I was on the way to the airport. I was flying to London, and they tried to take me away. Fortunately I managed to escape and I went to the police and got some protection. The military basically runs a shadow government and doesn’t want any sort of criticism about the way it operates in the country. And that’s why I was targeted. You mentioned that you believe the military was behind that abduction attempt. Can you be sure or is that just a guess? If you look at the way the military operates in the country, they have been attacking journalists, threatening them. There were cases of social media activists who went missing last year and when they came back we found out from those individuals that the military was keeping them in secret prisons. And over the years the way the military has threatened me. The military is not my enemy, but they perceived me as critical to them and they were threatening me. And the way they did it [suggests military involvement]. It was on Islamabad highway, in broad daylight at 8:30 in the morning with complete impunity and the modus operandi is like that. And when the kidnappers came toward me, they said something along the lines of what do I think of myself, and who do I think I am? So it was very personal in the sense that they wanted to come after me and make me go missing, perhaps because they wanted to teach me a lesson. Can you explain how you escaped? Once I was pinned down on the road, they were trying to take me away. They put me in a taxi — the taxi that I was traveling in [originally], which they had taken over. I was put in the taxi with a gun pointing to my stomach. Earlier they had told me if I don’t stop resisting they will shoot me, so I stopped resisting and then I went with them. So once I was sitting in the car, I told the guy to relax, because I am going with you, so why don’t you just relax. That’s when they relaxed and I saw an opportunity — one of the doors of the car was unlocked and I went for it. I opened it, I managed to get out of the car, and I just ran for my life. Behind me I could hear them saying to catch him, to shoot me, but I went across the road. There was oncoming traffic that I sort of dodged and I just ran. Luckily I managed to escape. Often when I talk to people from Pakistan, they use the term “establishment,” the people in power. You clearly name and blame the military. Is it because you are in exile and free? I was one of the few people who was not self-censoring and that’s perhaps why I was targeted. Back in Pakistan I would urge people and my fellow journalists to refer to them as they are: this is the Pakistan Army. Using the word “establishment” is a euphemistic way of saying it. It’s just plain and simple — the Pakistan Army. And that’s what I used to refer to them when I was in Islamabad and that’s why threats also came. In Paris you wrote an open letter to the army chief, which was published in The Guardian. What did you tell him? The idea for the letter came from the Pakistani interior minister himself. When I was in Pakistan, Pakistan Interior Minster S. N. Iqubal of the previous government invited me for a cup of tea to discuss my abduction attack. In that meeting he suggested I should write a letter to the Pakistani Army chief. Of course he wanted me to write a private letter, and sort of beg for forgiveness, apologize, and I wondered what I had done wrong. It showed his helplessness, because technically the interior minster is ranked above the army chief. But he was asking me to write a letter, asking for a pardon, from his own subordinate. It showed how helpless the Pakistani civilian government was. So at that time I decided once perhaps I am in a safer country, I will chose to write an open letter, and have completely different content. So the contents of this particular letter that I wrote to the army chief consisted of talking about how Pakistan is not safe for people who exercise their freedom of speech. Pakistan is not safe for journalists who have an independent point of view, and Pakistan is not safe for people who exercise dissent. Would you say the military is the principal agent of the censorship in Pakistan? It starts with the military. The Pakistan Army is the top of the hierarchy of censorship. They are the ones who lead this environment of creating self-censorship within journalists, within activists or just free thinkers. And then everybody follows. We have seen in the last few months leading up to the election how the judiciary has been behaving and trying to suppress freedom of speech. Then we also know about the religious lobbies or religious groups who also create an environment of fear, and sometimes accuse some people of blasphemy and try to silence them through that. So the Pakistani military leads the charge against the journalists, the freedom of press, and then rest of the institutions or stakeholders or people who do not want to have free speech follow the same methodology. I believe there is a close nexus that we have seen in the last few years, between the Pakistani state and the Pakistani nonstate actors. Nowadays I have seen evidence during my reporting about how the Pakistani state actually employs nonstate actors to silence people. They use militant groups to silence people. Journalists have been attacked through militant groups who are known to have close affiliation with the state, close affiliation with the Pakistan military. Geo is an example of that. We saw how Geo News was shut down a few years ago, over blasphemy accusations that came from a religious lobby. Those accusations came once Geo went against the military, saying that one of its journalists was attacked by the military. And instead of debating that particular issue, there were accusations of blasphemy against Geo and Geo was shutdown. Can you explain how you have observed censorship in Pakistan? If you look at the way the Pakistani media operates, it self-censors a lot. When it comes to topics related to the Pakistani military, when it comes to topics related to religion, particularly Islam, there is a lot of self-censorship that is exercised at all levels of newsmaking. At the level of the reporter, the journalist in the field, they exercise self-censorship when asking questions or reporting on particular issues, because they know they can get in trouble. When a journalist or reporter in the field has the courage to report on a sensitive or taboo topic, the newsroom editors block it. The Pakistani media owners have their own business interests, so there are the times they kill the stories. And this brings me to the initiative that I have, which is called Safe News Rooms, which is for South Asians to promote freedom of expression in newsrooms. Because there is a lot of censorship that is exercised by reporters, by editors, and by owners, and it’s being done on a regular, daily basis. Stories that are very important to the country — when it comes to military affairs, when it comes to religious issues — need to be debated, but are not debated at all. Mainstream media completely blacks out the stories. How does Safe News Rooms work? After my own experience in Pakistan of not self-censoring and going through the ordeal of threats, and the kidnapping attempt, once I got out I realized that I need to do something. The problem of the censorship is not just limited to Pakistan; it’s all across South Asia. Different stakeholders, different lobbies or pressure groups are forcing journalists to self-censor or to censor. So I recently launched safenewsrooms.org, which is a digital media platform that documents media censorship in Pakistan and South Asia Basically the idea behind Safe News Room is to document censorship that is practiced by journalists. So I reach out to journalists or journalists reach out to me and anonymously they can talk about how they have to self-censor or how they being forced to censor topics with regards to military or religion, or other sensitive topics. And the same time I also reach out to the victims of censorship. For example, religious minority groups or sexual minority groups who do not get any coverage or are censored by the mainstream media — I reach out to them and also they reach out to me and express their own feelings about being censored. So it’s a twofold thing: talking to journalists about how they are censoring and also talking to victims of censorship about how they feel. How has censorship worked in the lead-up to this election? One thing we have to understand is that this year the clampdown against press freedom has been intensified. One of the reasons is because the Pakistani military doesn’t want the last ruling party of Nawaz Sharif to come back to power. It believes the Nawaz Sharif-led government tilted the civil-military balance in the favor of civilians. So given that, the Pakistani military is ensuring that there is pre-poll rigging. Politicians are forced to join parties or leave parties that are considered anti-military (or “anti-establishment” as it is referred to in Pakistan). And all of this is not reported independently in Pakistan because of this environment of fear that they have created by attacking journalists, by attacking activists. Basically they want to get away with manipulating the election without it being pointed out that this election is not free and fair. So this is very important context. Going into the election on July 25, we’ll see that there are more controls on press freedom and without a free press, there can’t be any free elections. This is what the Pakistani military has managed to establish. Some of the militant organizations in Pakistan are participating in the election this July. How do you see it? Militants are participating in elections under the so-called policy of mainstreaming extremists by Pakistan Army. The army claims such a policy will encourage militants to become a peaceful part of society; however, such extremists have not given up on their old ways. Many of them continue to have militant wings and now political wings, making them a double threat. The real reason why the army brought them [into politics] is not to mainstream them but to dent the vote of popular parties in Punjab, especially that of Nawaz Sharif, the former prime minister, whose party was leading the last government and who enjoys the vote bank these militants are now trying to capture. So in a way it’s [meant] to erode Sharif’s vote. If you get the opportunity to return to Pakistan, will you? Of course. Pakistan is my country and my home. I would love to return but for now my life is under threat there, especially because I continue to highlight the abuses of the military at international forums through my reporting, activism and social media. I know if I continue in the same manner, returning to Pakistan will mean I might be killed at the airport when I land or be abducted and go missing forever. So since I want to continue exercising my right to freedom of expression and help other voices in Pakistan reach a global audience through my digital initiative, I will continue to live in exile. Aaquib Khan is a freelance multi-media journalist, based in Bombay, India. Follow him on Twitter: @kaqibb. Will the incoming prime minister deliver a new – and better – Pakistan for the country's women?